A Model Failure: Why the world needs a new social contract | The Forum Network, hosted by the OECD: Shape ideas. Shape policy. Shape the Future. With earnings falling and inequality rising for many working people, there is an increasing appetite to rethink our global economic model. Sharan Burrow, General Secretary of the International Trade Union Confederation, insists that international co-operation is essential to reforming globalisation to be more inclusive. Democracy is collateral damage in a world where multilateralism has failed and a model of corporate greed has demolished the promises of the social contract that was carved out of the destiny of two world wars and a Great Depression. This global model of economic growth has fueled the corporate greed which has torn apart the social contract. 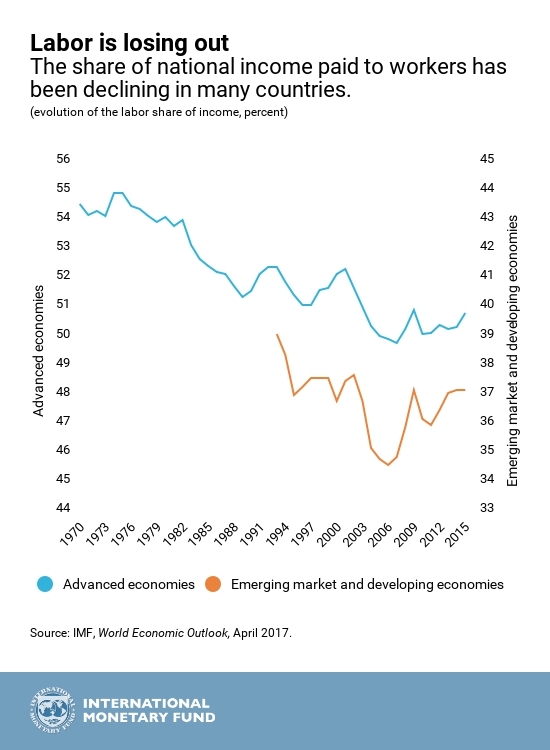 Global earnings for working people have been falling for the past three decades, and income inequality has grown in 53% of countries. It is this very same model of growth that has contributed to the decline in the labour share of income across OECD economies, and to wages systematically falling behind productivity growth in a majority of them – a model that denies workers their fair share of the fruits of economic progress. Ninety-four per cent of workers in the world’s supply chains are in low-wage, insecure and often unsafe work. Seventy per cent of the world has no or inadequate social protection while at least US$21 trillion is stashed away in tax havens. Global coherence, driven by co-operation in multilateral institutions, makes perfect sense if all voices are equal: if governments bring the voices of the people to the table, and not those of big business. There is a business community that understands that today’s model of globalisation is creating massive inequality, spawning human rights abuses, reaping environmental destruction and ultimately destroying the markets they depend on. Unfortunately, there is a larger business community that cannot or will not see beyond their own profits. Where the social contract is in place and governments respect the role of social partners in negotiating solutions, where social protection, minimum living wages, collective bargaining, vital public services, industry policy and fair taxation are in place, inclusive growth is possible. While these societies are not immune to the challenges of climate, rapid digitalisation, robotics or automation, collective responsibility for negotiating just transitions can give us answers. Tragically there are few of them: the Nordic countries, Germany, Canada, New Zealand, perhaps Japan, and there is some renewed hope in Portugal. The agreement of a new social pillar in Europe holds promise, but the legislation that will ensure implementation must be delivered. The harsh reality is that the bulk of the global economy is mired in a model of self-destruction with the lives and livelihoods of working families in the centre of this storm. When governments fail to regulate for decent work to protect their people against exploitation, to ensure corporates taxes are paid to enable them to provide education and health for all people, to invest in vital infrastructure or care to create jobs, they create mistrust. And when people see no dividends from democracy, that mistrust includes democratic institutions. 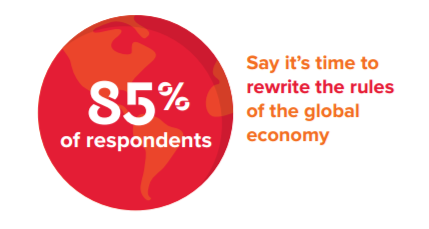 Eighty-five per cent of the world’s people want the rules of the global economy rewritten, and people unanimously believe that the world would be a better place if governments were more committed to jobs and decent work; caring for children, the elderly and the sick; human and labour rights; democratic rights and freedoms; shared prosperity; and action on climate change. More of the same with a fresh lick of paint and a slicker sales pitch will not cut it. Free trade that allows slavery, includes informal work under the pretence of independent entrepreneurs, depends on paying a poverty wage, guarantees neither freedom of association nor collective bargaining rights, obscures responsibility for safe work and encourages tax evasion is an immoral construct. If this is modern-day multilateralism, then it must fall. Equally the Bretton Woods institutions must be reformed. We call on G20 governments to sponsor broad consultation towards the development of new global architecture with trade unions, business and civil society. This architecture must drive the implementation of the Sustainable Development Goals with a commitment to Just Transition measures required to protect workers and communities in the global shifts from climate action and technology developments. Policies that support privatisation, constraints on minimum wages and collective bargaining, cuts to pensions and other social protection measures simply mean the destruction of people’s hope and security. The stability and development these institutions are charged with is missing in action. And while the UN must reform, it cannot be at the expense of the core mandate of rights that emerged as a foundation for the social contract of the last century and the hope of peace and prosperity. 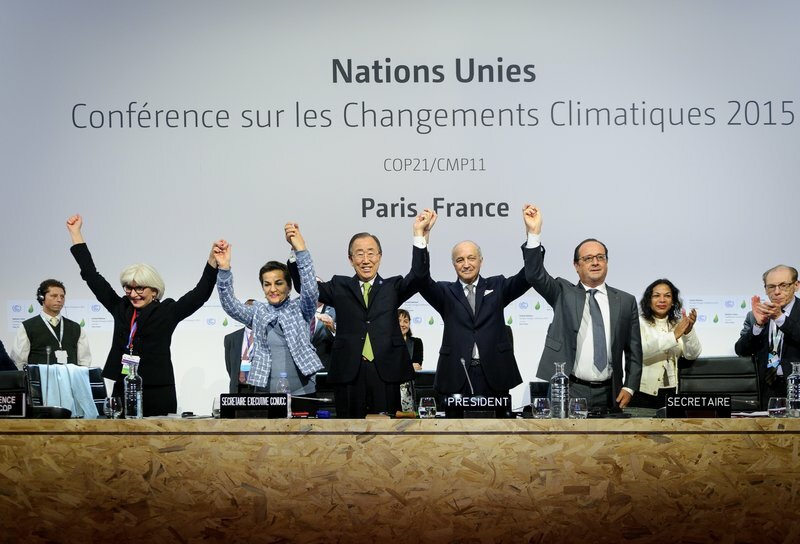 Multilateralism is an imperative if we are to deliver the promises of the Sustainable Development Goals and the Paris Climate Agreement – the promise of a zero-poverty, zero-carbon world – but it will take a massive reform of the mandate of global governance and the commitment of national governments to act in the interests of their people. The OECD has just reached an agreement on general due diligence guidance, so a good place to start would be to follow the French government’s lead and mandate due diligence, and consequently transparency and responsibility, of our largest corporations. Further, this should be in line with the UN Guiding Principles on Business and Human Rights and, as far as the OECD is concerned, the Guidelines for Multinational Enterprises. The Swedish-backed ILO-OECD initiative the Global Deal can help rebuild the partnerships that will drive a community for change, but it must include social dialogue that results in a new social contract. These are the floor of a new social contract vital to repair the mistrust in globalisation. When this is implemented with a regulatory framework that ensures that all businesses must have a “social license to operate” – and that also mandates due diligence, grievance and remedy concerning human and labour rights and ensures taxation is paid where it is earned – we can begin to rebuild a fair competition floor on which the challenges of the future of work can be tackled. 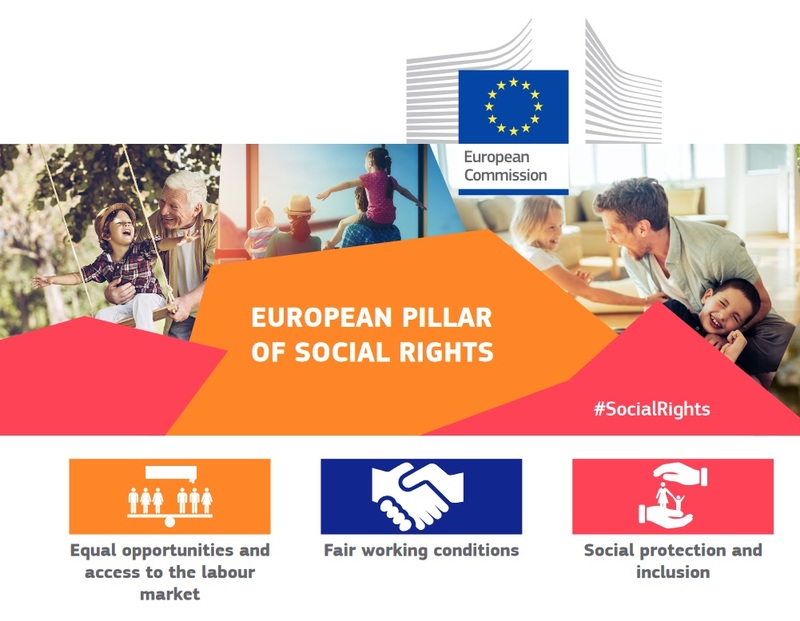 Social dialogue must be respected in all workplace settings; the implementation of the European Social Pillar could be a basis for progress if the legislative foundations are secured and provide a roadmap to shape the future of work globally. Macroeconomic policy must change massively to focus on these measures for inclusive growth, full employment and decent work. This requires fundamental reform of multilateral institutions and governance nationally and internationally, for peace and social and economic justice must be at the core of a renewed mandate for all institutions. The Inclusive Growth Framework that the OECD is developing can bring the right policy response to the challenges that we face. For that to happen this Framework, and the OECD as a whole, must insist on the centrality of social dialogue, collective bargaining and a Just Transition for workers in today’s and tomorrow’s increasingly digitalised and low-carbon economies.